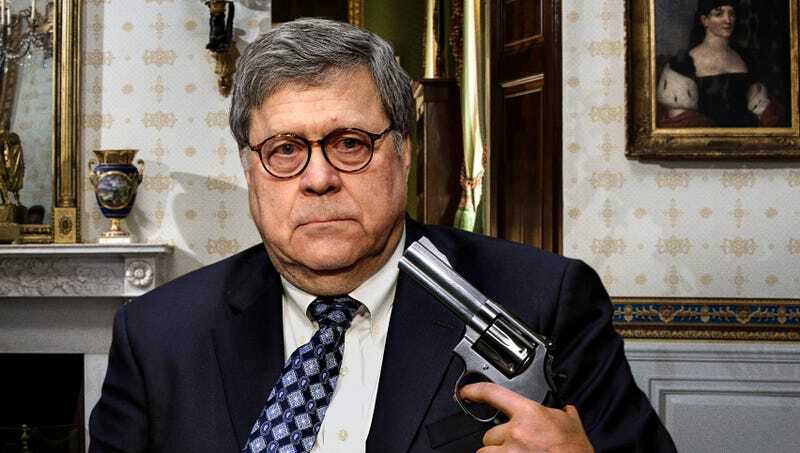 WASHINGTON—Saying it was the only way to really know whether he could trust his new attorney general, President Trump loaded a single bullet into a .357 Magnum revolver and demanded William Barr prove his loyalty by putting the barrel in his mouth and pulling the trigger, White House sources confirmed Friday. “If you’re going to be in my Cabinet, I gotta make sure I have your complete allegiance,” said the president before spinning the cylinder and handing the loaded weapon to the whimpering Justice Department head. “I’ve been burned before, Bill, and this time I’m not taking any chances. Interviews, vetting, the Senate confirmation—all meaningless. This is the only test that matters.” At press time, Trump was reportedly leading deputy attorney general nominee Jeffrey Rosen into a darkened room and ordering him to murder a bound-and-gagged White House aide, who was believed to have betrayed the president.